Of course the Marshmallow Madness cookbook came to me when I was training for a boxing tournament and had to maintain weight. The cookbook itself was inviting, with its foam cover, cute fonts, and girly colors. I devoured the colorful photos and drooled over the creative recipes. I don’t know what is more unbelievable, the fact that a girl like me boxes or the fact that I didn’t gain five pounds from all the marshmallow experimenting. 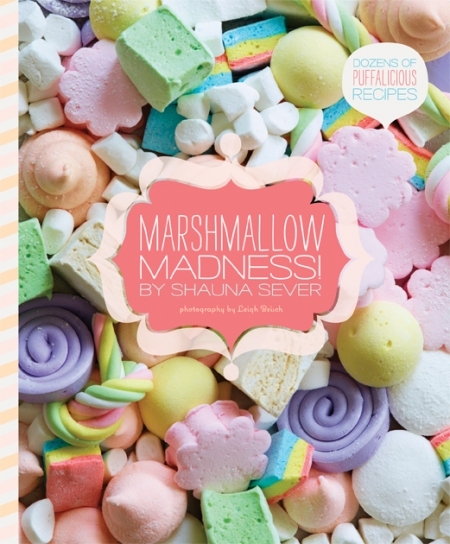 Quirk Books, publishers of Marshmallow Madness by Shauna Server, came up with the sweet idea to launch a Marsh Madness campaign. For those of us who don’t care for basketball’s March Madness, this is the fluffier alternative where everybody wins! (Sort of—at least everyone gets great recipes, but there is technically one “winner.”) The competition began with 16 bloggers set up in regional brackets. We were asked to create our own spin on Shauna Server’s Classic Vanilla Marshmallow recipe and go head to head each week with fellow food bloggers. Each week, Serious Eats will recap the mallow recipes and Server herself will choose the winning marshmallow at the end of the tournament. I guess you could say my inspiration came from my training diet. I could have gone all out and loaded my recipe with chocolate and nuts and caramel, but just thinking about it made me feel heavy. Marshmallows should be billowy and light with a hint of flavor just like Server’s original Classic Vanilla Marshmallow recipe. So I added a little grapefruit juice and honey (the breakfast of dieting champions) and and shaped the marshmallows in a small bowl. After the mallowing process, I cut the marshmallows into wedges and coated the “rinds” in raw cane sugar and zest. The result was a delicate and sweet grapefruit marshmallow with a crunchy edge reminiscent of Easter peeps. Check out the recipe (and Marsh Madness bracket!) below. Leave a comment below and tell us about your favorite marshmallow flavor (real or imagined). Lightly coat four four-inch bowls with cooking spray. Mix together corn starch and confectioners’ sugar in a small bowl to make the coating. Whisk together the gelatin, grapefruit juice and cold water in a small bowl and let soften for 5 minutes. Stir together the corn syrup and honey in a small bowl. Pour about half the mixture in an electric stand mixer and the other half in a medium saucepan. Stir in the sugar, 1/3 cup of grapefruit juice, and salt in a medium saucepan over high heat. Boil, stirring occasionally, until the temperature reaches 240°F. Microwave gelatin mixture on high until completely melted, about 30 seconds. Pour it into the mixer bowl. Set the mixer speed to low and keep it running. When the syrup reaches 240°F, slowly pour it into the mixer bowl. Increase the speed to medium and beat for 5 minutes. Increase to medium-high and beat for 3 more minutes. Beat on the highest setting for 3 to 4 minutes more and beat in the vanilla and red food coloring; the finished marshmallow will be opaque, fluffy, and tripled in volume. Pour it into the prepared bowls, using an offset spatula to smooth it into the corners. Sift coating evenly and generously over the top. Let set for at least 6 hours in a cool, dry place. Use a knife to loosen the marshmallow from the edges of the bowls. Invert the slab onto a coating-dusted work surface. 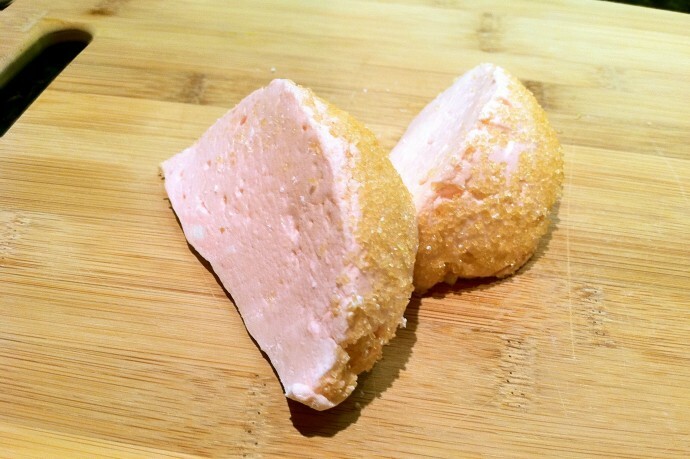 Make the “rind” coating by mixing together cane sugar and zest. Roll the rounded side in the “rind” coating. Cut into quarters like grapefruit wedges. Dip the sticky edges of the marshmallows in more coating, patting off the excess. To follow along with Marsh Madness, check out the bracket of participating bloggers! I’d love to see a raspberry marshmallow… it would be the best in the world with a pot of chocolate fondue or dropped into hot chocolate. I love cinnamon marshmallows. They are just as versatile as vanilla and oh so delicious. I love just plain ol marshmellows but on a chocolate cupcake with coconut all around! Yummm! I would love a tangerine marshmallow. Covered in chocolate. As a kid I remember chocolate flavored marshmallows – I haven’t seen them in ages! I’ve only had vanilla and chocolate marshmallows out of the bag. Not very tasty. I’m looking forward to trying some of the recipes from the Marsh Madness campaign. They all look so tasty. I think if I could pick my own favorite flavor, I’d pick toasted coconut. Maybe I ought to give it a try! I would LOVE to indulge in a blood-orange marshmallow–maybe do a makeshift “smore” with puff pastry, yogurt, and the marshmallow?? A s’mores marshmallow; basically a vanilla marshmallow covered in chocolate, then dipped in graham cracker crumbs. Yummy! My favorite flavor is vanilla, with toasted coconut a close second. I’d love a latte marshmallow! I’m in the “Wow! You can make marshmallows? !” group. I’m impressed!